Story by Bob Gwizdz and published courtesy of MDNR – The upper Black River, in the northeastern Lower Peninsula, has long been recognized as one of Michigan’s best brook trout streams. Earnest Hemingway, who fished there, wrote about it glowingly. But that doesn’t mean it can’t be even better. And an unusual group – the Upper Black River Council – has been doing its best to make it so. 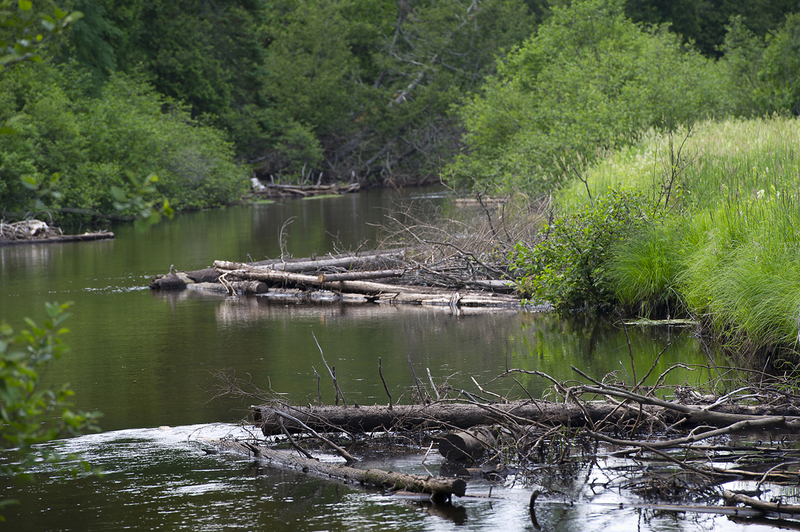 Recent efforts on the Black River include improving road/stream crossings, removal of dams (built by humans as well as beavers), and placement of large woody debris, which provides a number of benefits to the river and its residents. The woody-debris structures – which are built in a generally trapezoidal shape – are designed to perform a variety of functions according to Cwalinski. They provide diverse in-stream cover for both juvenile and adult trout. They accumulate silt (uncovering coarser substrates in mid channel that may provide spawning habitat for trout), provide additional surface area for aquatic insects, and they stabilize erodible banks. “Some structures are built in order to capture sand and sediment and build bank,” Cwalinski explained. “And while that might have been the goal of the structure, the ends of the structure – further out in the stream – are still being used by adult fish. The Upper Black River Council is made up of a wide variety of organizations and individuals – the DNR Fisheries Division, U.S. Fish and Wildlife Service, Huron Pines (a conservation group), private landowners, Canada Creek Ranch, Black River Ranch, the Tip of the Mitt Watershed Council, and the Northeast Michigan Council of Governments (NEMCOG) among them. They all add up to an award-winning crew that gets things accomplished. Cwalinski said the council is invaluable. Nico Tucker, a transportation and natural resources planner with NEMCOG, oversees the four-man work crew on the Black River. A former hands-on river restorer himself, Tucker says his crews have put in more than 1,000 structures and enhanced eight or nine miles of river since he took on the job in 2007. Tucker said he usually walks the stream with Cwalinski, identifying areas that can use structures, and then he compiles the permit application. He serves as liaison to the council, which comes up with funding for the projects. One recent achievement is the removal of Saunders Dam, which was on private property that was purchased by the DNR through a Natural Resources Trust Fund grant. Fisheries Division evaluated the dam, decided it should be removed, and then worked with a variety of partners to get it done. As a result, the trout now have unhindered access to eight more miles of river upstream. “The Fish and Wildlife Service provided a fish passage grant, Huron Pines helped administer the grants – it’s a group of partners overseeing this watershed, under the oversight of the Black River Council,” Cwalinski said. Cwalinski said the private ranches often use the work crews to maintain and enhance their stretches of stream, then pay the service. It’s a working relationship that benefits everyone. “This is one of our best-organized watershed groups,” Cwalinski said. “I wish we had these for the other watersheds up here. 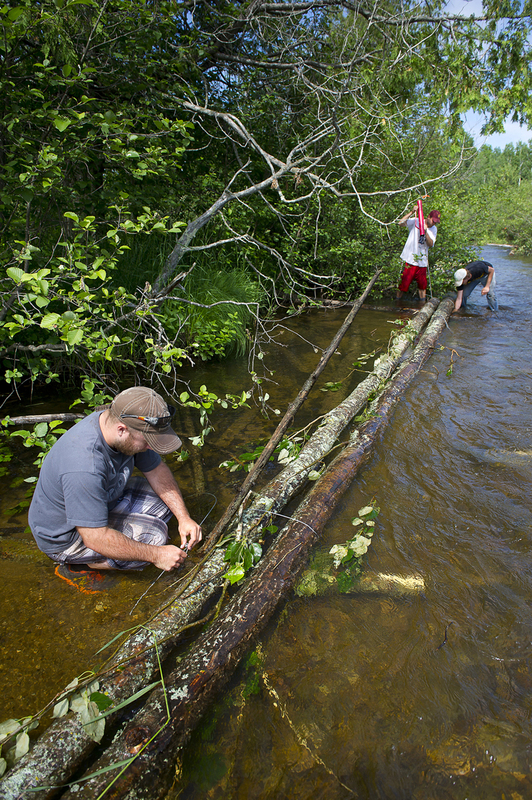 The Upper Black River Council is there to improve, maintain and give back to the watershed. For more information on the Upper Black River Council, visit their website.